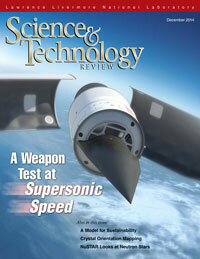 The Laboratory’s work on a successful rocket sled test showcases an efficient approach for developing complex conventional munitions for supersonic aerospace systems. By reducing water and energy consumption and adopting clean energy technologies, the Laboratory is working to become a model sustainable enterprise. With crystal orientation mapping, researchers can study a material’s microstructure at various scales. Scientists are using high-energy x-ray data from NASA’s Nuclear Spectroscopic Telescope Array (NuSTAR) to explain the diverse properties of neutron stars.